'He thought, spoke and lived climbing.’ Writing in ‘Space Below My Feet’ Gwen Moffat was struck at the meticulous thought with which Johnnie Lees approached the mountains. Everything was considered and understood in detail; from the way he moved on rock, to his technical rope work. Around the same time he met Gwen Moffat at the Pen y Gwryd Hotel, Johnnie took over as leader of the RAF Valley Mountain Rescue Team based on Anglesey. An unofficial rescue presence had been stationed at the Caernarfon Airport in Llanwrog since 1941. The 40s were a torrid time for air crashes in the area, and Flight Lieutenant George Graham was struggling to keep his team up to scratch in the face of increasing accidents. A team was formalised in 1944 yet there were still organisational and operational issues when Johnnie joined in the early 50s. On the 10th January 1952 an Aer Lingus flight travelling between Northolt and Dublin came down in thick cloud, crash landing into Cwm Edno. Responding to the initial call the Mountain Rescue Team were preparing to assemble at Porthmadog, having received reports that the plane had come down in the local area. Yet there was some confusion. Intercepting the team in Caernarfon, the police wondered why they were headed south rather than east in to Nant Gwynant. Initial calls from Air Traffic Control Valley it transpired had misplaced the crash site in the Porthmadog area. Quickly reassessing and changing course, the team headed for Moel Meirch where they found the gnarled remnants of the plane, all on board had been killed. Against a backdrop of organisational change and internal politics, Johnnie joined the Royal Air Force after the Second World War and his first Physical Instructor postings took him all over the UK. Early on he climbed new routes on Harrison Rocks and went on to climb in North Wales and the Alps as well as partaking in the first RAF Himalayan expedition to Kulti Himal. His experience did not go unnoticed and was part of the early discussions that reassessed the RAF’s approach to mountain work. Johnnie’s clear thinking and pragmatism was needed amid tension surrounding mountain rescue. In the 1950s a growing realisation was developing: skilled climbers and a better operating structure were desperately needed. Discussions were fast moving and began a closer working relationship between the RAF Mountaineering Association and Mountain Rescue. 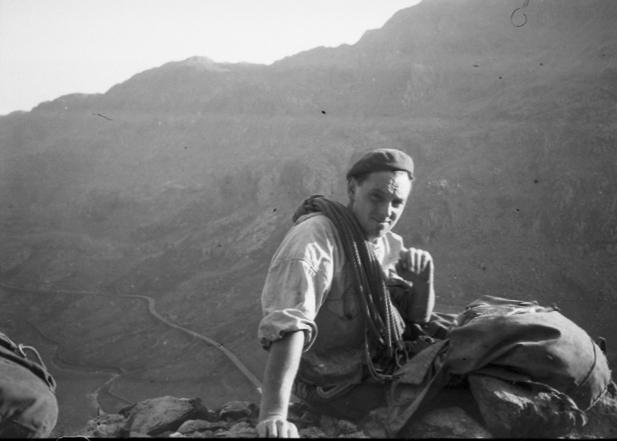 Johnnie was well placed to lead under the change of direction, and ran the early training courses in Snowdonia where his meticulous approach to climbing heralded an immediate impact. His distinctive red beret quickly became a hallmark of a individual that demanded high standards of himself and those around him. Gwen Moffat remembers that he would not tolerate ‘heaving on one’s arms’, demonstrating an effortlessness on rock that came from his extensive experience. He was only in his late twenties at the time, yet to the young servicemen Johnnie was a tower of experience. Early experiences on Helvellyn with his father are recorded in his climbing log by a postcard labelled ‘My first real mountain’. From here he developed a reputation for unquenchable enthusiasm and a startling memory for routes and techniques. In 1950 he made his first alpine trip, a summer which Denis Greenald remembers fondly as a vintage season for British climbers, ‘just about everybody seemed to be in Chamonix.’ Amongst a multitude of routes he made an ascent of the Grépon along with nine others. From here he went straight on to the RAF College Mountaineering Club Glencoe meet. Returning later with Thomas Graham Brown to explore the remote Etive valley and Trilleachan Slabs from Brown’s boat on Loch Etive. Johnnie drew from these experiences with total commitment. Sometimes controversial but always clear minded, he made a deep impression on the team, not least former General Secretary of the British Mountaineering Council, Derek Walker. Joining the Valley team in 1955 as a young man, Derek notes that his experiences in Snowdonia ‘really changed my life and completely enthused me about climbing. Johnnie’s philosophy was extending throughout the RAF and influencing mountain rescue at the highest level. A posting in 1952 to Kinloss in Scotland saw him develop challenging and comprehensive training courses for RAF personnel alongside Education Officer Dan Stewart, and he was a vocal voice at organisational and governmental meetings with the RAF Mountaineering Association and the Air Ministry. Whilst he had the experience and clout to make himself heard, Johnnie failed to be satisfied and continued to push his own experience further. 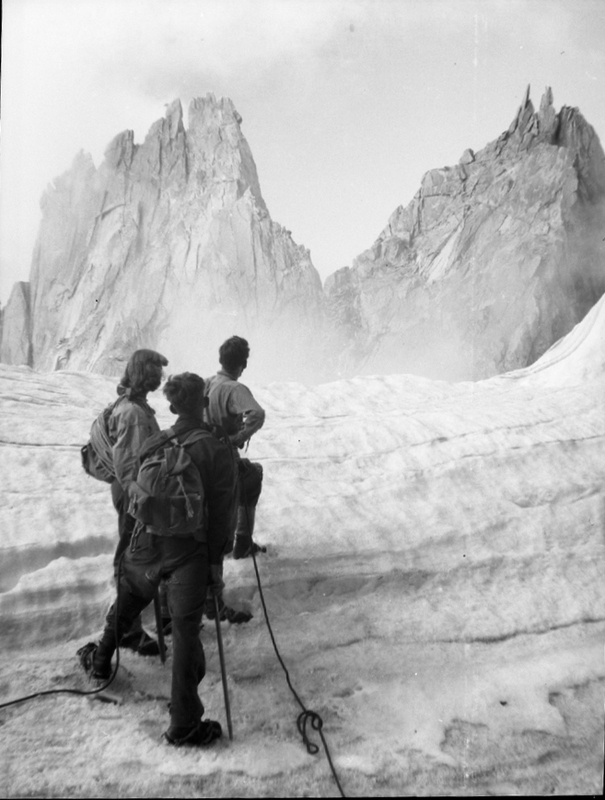 In 1953 he completed his third alpine trip during which he climbed on the Aguille de l’Midi and Charmoz-Grépon traverse, as well as completing a traverse between the Mont Mallet, Aiguille de Rochefort and Dent du Géant. Back home, life in mountain rescue was as fraught as ever. In 1952 promising local Valley member, David Gwyndaf Thomas fell off One Pitch Gully on Cadair Idris, cutting the rope in the process and plunging to his death. Later that year an Anson aeroplane came down in thick mist close to the Llanberis railway line on its journey from RAF Aldergorve. Nationally as well there was strain beginning to show. Proposals had been tendered to disband the South Wales team and direct the Valley team to cover the whole of Wales. After much debate the proposals were dropped. Lees was a commanding presence in the face of such upheaval and not afraid of making his opinions known. He argued extensively for the Valley team to be deployed faster, regardless of whether the need for a mountain rescue team had been established. Even if it transpired the incident did not need a rescue, deploying as soon as a call came in would cut casualty waiting times in those instances where it was needed, instead of waiting for all the facts. He was equally however a man of action when needed, and perhaps his most widely known feat is of the rescue of Hugh Robertson who had fallen from Amphitheatre Buttress in 1958. It was clear that to get Robertson off the ledge would require an abseil of 200 feet and the well drilled team began preparing the stretcher. Johnnie however decided differently. Robertson was delirious and getting colder as the night closed in. Arranging a stretcher would have taken too long, and with Robertson’s condition deteriorating, Lees made the decision to be lowered with Robertson strapped flailing to his back using a Tragsitz technique. His decision cut hours off the rescue and very likely saved Robertson’s life. Johnnie’s actions went down in legend amongst mountain rescue teams which were recognised with the awarding of the George Medal. Lees retired from the Valley team in 1961 yet his continued belief in learning laid the founding philosophy for the Mountain Training Board which has formalised the skills and mountain craft still used today. His impact on mountain rescue would reappear again as Chairman of the BMC Safety Committee in the 1970s and as the first President of the RAF Mountain Rescue Association in 1993. For Lees there was always something new to learn. If an accident occurred he wanted to know why it happened? What could be improved? And could things have been prevented? Writing Johnnie’s memoir in the 2003 Alpine Journal, Denis Greenald notes that he ‘cared passionately about the mountain environment and for the safety of the people who ventured into it.’ Johnnie knew himself the joys that could be gained of moving competently in mountainous environments and was driven to see others experience the same.